The Shorty Rossi Cigar Collection - Grupo Luigi Rossi de América S.A. 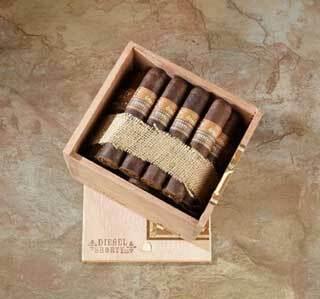 In Spring 2 010, Shorty received a personal invitation from Diesel cigar maker Abdel (A.J.) Fernandez to visit the factory and get a first-hand look at production, in addition to experiencing cigar country for a week. Shorty got a real taste of what cigar life is all about, visiting factories, farms and tobacco processing facilities. He was also given an opportunity tomake his very own size in the Diesel line on this first trip and since then has developed a full line of Shorty Cigars. Shorty’s Cigars are available at select tobacconists across the country, at Cigar.com and for qualified Wholesale buyers, online at Meier Dutch. When it comes to a loyal following, no crowd is more devoted than the fans of Diesel cigars. Carefully crafted in Nicaragua, and delivering big-time balanced flavors, Diesel cigars have bridged the gap between finely crafted boutique handmades and an affordable price tag. A feat most brands ? if any ? can’t come close to matching. The Diesel Grind is currently available only to licensed resellers exclusively from Meir and Dutch. You won’t want to miss this one, so request them at your local tobacco store. Shorty has always been fond of a fine premium cigar. In fact, if you watch “Pit Boss” on Animal Planet, you’ll find Shorty enjoying cigar after cigar in nearly every episode! Much like everything else Shorty is involved with, his cigars have been a huge success and has now spawned multiple releases. On top of being great blends, a portion of the proceeds from each Shorty branded purchase are donated…that’s the Shorty Rossi way.